Although many childbirth professionals have been using Peanut Balls for birth with their clients and patients in labor for decades, these balls are really creating a buzz now! 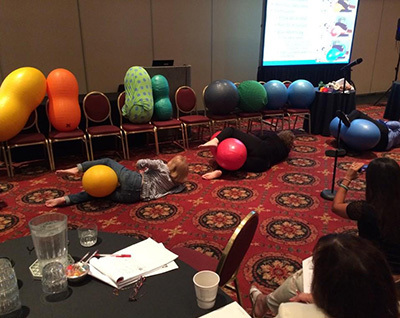 These peanut-shaped exercise balls can be used in a variety of ways to ease the discomfort of childbirth and progress labor. Laboring mothers can sit on them, lean forward over them in a hand-and-knees position or place the peanut ball between their legs while in a side-lying position to help with the birth process. Women demonstrating the use of different sized peanut-balls. Peanut Balls come in different sizes. The sizes available are 40cm, 50cm, 60cm, and 70 cm. There are several sizes of peanut balls, so it is important to have the correct size for your client during her birth. I Can’t Afford More Than One; Which Size Fits Most Women? If you are just beginning your Peanut Ball collection, or can only purchase one, consider choosing a size that is likely to fit most women. The 50cm peanut ball generally accommodates most women, and can even be deflated slightly to fit shorter mothers. It is important to ensure it is a burst resistant ball and is latex free. The 40cm Peanut Ball can also fit most clients, and can be inflated to maximum capacity to fit larger or taller women. Premier Birth Tools is committed to providing you with the best resources and tools for your birth business, especially when it comes to peanut balls. Contact Premier Birth Tools today with any questions you have and we will help you to get the education, tools and information you need to give birth with balls!